Since cameras captured the break-up of the Soviet bloc, the course of Czech documentary has made a pronounced illustration of the loss of foundations, search for new networks and remodeled aspirations of post-Communist art. The season of Czech documentary springs from its double ingenuity in confronting dilemmas of post-Communist culture. To overcome limited support, established organizations have expanded their functions, as the energies of new groups transcend local needs. The reach of fresh networks then matches the depth of scrutiny in films that plumb the country’s traditions, and pursue its transformations. Both the industrial and creative orientations of Czech nonfiction film have been refreshed. After filmmakers closed the Czech stand at Cannes in 2006, Parliament added another CZK 100 million crowns ($4.7 million) to the State Fund for Cinematography. However, grants for single projects are still capped at half of a film’s costs, with no distinction made between a major fiction feature and a low-budget documentary. In addition, to receive state money, a project has to have a co-production contract securing the rest of its budget. With the majority of docs co-produced by Czech Television, filmmakers are caught between the Fund requirement and ČTV bureaucracy. In response, a Hollywood visitor might be surprised to find the Republic’s film school acting as a production company, as well as students turning professional early in their studies and festivals planning school curricula. But necessity and documentary’s potential are proving the parents of invention. Dean Michal Bregant has enabled the national cinema school, Filmová a Televizní Fakulta Akademie Múzických Umění v Praze (FAMU), to serve as a grant provider and co-producer of student works. The top recent successes of Czech documentary were both FAMU graduation films from 2004: the domestic hit Beauty Exchange (Ženy pro Měny, Erika Hníková), which exposes the hold of women’s magazines on their readers, and the international festival success Czech Dream (Český Sen, Vít Klusák and Filip Remunda), which follows the public relations campaign for a fictional “hypermarket” fabricated by the filmmakers. FAMU also nurtured the young independent producers Richard Němec, Vratislav Šlajer, Pavel Strnad and Karla Stojáková, who formed their companies while in school. While their firms remain solvent through fiction features, TV series and service contracts, the producers retain their student openness in documentary projects—“adventures with friends,” as Stojáková terms them. Lost Holiday, Lucie Králová’s FAMU graduation film, demonstrates Czech nonfiction’s institutional and procedural freedom. Produced by DOCUfilm, the company of one of her professors, with Czech Television, the “documentary detective story” follows the recovery, by a Czech tourist in Sweden, of undeveloped photographs of Asian men on vacation. Following an appeal on Chinese State TV, the film has incorporated a surprise twist late in its editing. Founded in the past decade, the Institute of Documentary Film (IDF) and the Jihlava and One World Festivals apply a progressive cosmopolitanism to the sense of provincial cramp. Like Czech producers, the groups’ founders and staff are notably young. While they continually seek grants and sponsorship, the youthful cineastes have brought documentary into vogue. The IDF (www.docuinter.net) has turned Czech impasses into regional initiatives. The Institute aims to educate filmmakers about the European doc market, and to expose editors and programmers to docs from the East. Some older filmmakers claim the IDF’s programs mold projects to market demands that, like Communist ideology, constrain creativity. Director Andrea Prenghyová, who co-founded the Institute with Filip Remunda, responds that filmmakers can be free when they know the market’s “rules of play,” finding the editor and slot to let them make the film they wish. Beginning with project pitching in its East European Forum, the IDF now develops works through production in its Ex-Oriente program, and makes completed docs available to buyers, distributors and programmers at its East Silver Film Market, a traveling video library that accepts films for free. As a summary of its networking, the IDF’s website-based “Map of Europe” displays national schools, production companies, TV stations, grant opportunities, festivals and other fundamental doc information across the continent. Vary has increased its doc screenings and programs, including “Docu Talents from the East,” a selection of works-in-progress across the region. Among younger festivals, Jihlava (www.dokument-festival.cz) works most closely with the IDF, also sponsoring Docu Talents, and hosting the Forum and Market. Under director Marek Hovorka, the event in an eastern Bohemian provincial capital has become the region’s largest doc festival, granting awards for the best films from the Republic, Central Europe and around the world. The event’s ambitions extend to making its programmed films, and selected international docs, available for downloading on its “Doc Air” website (www.doc-air.com). Devotion to nonfiction film created the IDF and Jihlava; the One World Festival grew from a promotional event for the humanitarian group People In Need into a celebration of global documentary. Jihlava’s emphasis on creative auteurs in October complements One World’s dedication to social issues in March. Nearly one-third of the spectators for the latter event in Prague are schoolteachers and pupils, for whom the festival creates curricula for topics like AIDS and racism. The packed screenings at both festivals create atmospheres of engaging entertainment. One World’s director, Igor Blazević, locates the films’ appeal in the “identity search” of young Czechs into modes of life and styles of expression mirrored in lenses of documentary. 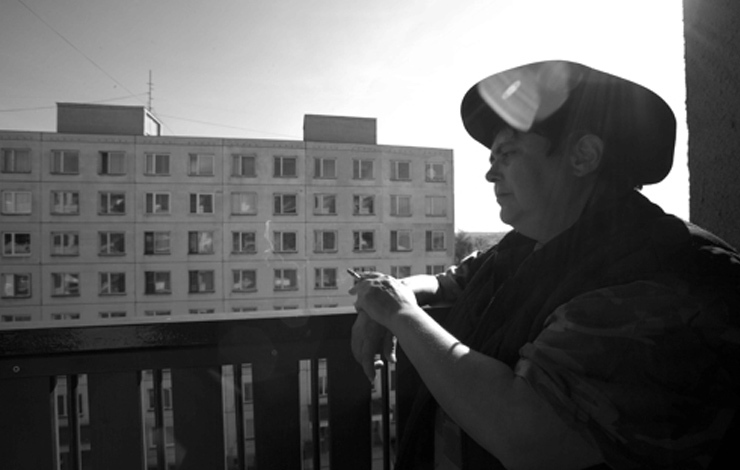 Czech docs span the form’s stylistic range, from Jan Šikl’s narrated histories over amateur archival footage, to the observational, inter-cultural exchanges of the late Pavel Koutecký, to Pavel Marek’s dialogue with his subject and documentary form in Houslový Rytíř (Violin Knight). A singular aesthetic already appears in student Hana Valentová’s Rá, which in one shot frames its female subject from the neck down, as she recalls being judged for not wanting to have children. Yet in their variety, Czech films reveal patterns of documentary for the whole former Eastern block, such as in imaginative co-productions. In Who Will Teach Me the Other Half of the Character (Kdo Mě Naučí Půl Znaku, Martin Ryšavý), interviews with Vietnamese who studied in Czechoslovakia during the Cold War reflect original luster on a Czech filmmaker’s foreign stay. Then, films like Czech Dream and Beauty Exchange represent investigations into phenomena the West takes for granted––like marketing and self-realization through sales. Such docs mix attitudes of innocence and interrogation, recalling both the late documentarian Jan Špáta, who claimed that a filmmaker might find “beautiful things basically everywhere,” and the current head of FAMU’s documentary department, Karel Vachek, who believes everyone can be exposed. The latter’s rebelliousness permeates his Záviš—The Prince of PornMusic under the Influence of Griffith’s ‘Intolerance’ [sic], and films of the coming generation like Left, Right, Forward! (Kupředu Levá, Kupředu Pravá, Linda Jablonská), which portrays the faiths of young Communists and young conservatives as equally ludicrous. Vachek, however, asserts that the Czech tradition of social acuity produces individuals, not followers “who dress in my clothes.” Filmmakers’ independence appears in a third category of works that, like others from the region, focus on the fragile endurance of places and people: the multi-culturalism of the eastern Carpathians in Other Worlds (Iné Svety, Marko Škop), northern Moravian mining settlements stuck in time in Industrial Elegy (Industriální Elegie, Daniela Gébová), two families that fail to reconcile over the singing talents of a young Gypsy girl (Vierka, Miroslav Janek, 2005), and three dauntless female survivors of fascism and communism in My Twentieth Century (Moje 20 Století, Olga Sommerová, 2005). Helena Třeštíková’s Marcela testifies to the preservation of both a personality and a film record: the picture evolved from her “time-collecting” 1980s series of Marriage Studies to bring one woman’s trials in marriage and motherhood up to date. The affecting chronicle will be her first to have international exposure. The permutations for promoting Czech documentaries distinguish its possible futures. Despite the aversion to nonfiction film from pre-revolutionary political supervision, and the modern antipathy to non-commercial movies, Marcela will have a theatrical release through the production company Negativ and distributor AeroFilms. Having opened offices last year in Prague, the agent Taskovski Films will handle the picture’s foreign and festival sales. past year, Jihlava hosted Sean Farnel of Toronto’s Hot Docs to program his series “Spotlight on Central and East European Film,” while One World invited Cara Mertes of the Sundance Institute, among other guests, to prepare local artists for foreign pitches and grants. In contrast, Filip Remunda warns that serving six commissioning TV editors could mean making six different versions of a documentary. In its long festival life, his and Klusák’s Czech Dream was chosen by Michael Moore for his Traverse City Festival in 2005, had an American release in IFC cinemas this June, and is scheduled to appear on DVD under the label “Morgan Spurlock Presents.” American filmmakers’ adoption of the movie suggests how its view of society behind the former Iron Curtain can invigorate advocacy in Western documentary. Finally, for The Source (Zdroj, 2005), which examines the exploitation of an oil pipeline from Azerbaijan, producer Vratislav Šlajer and director Martin Mareček sent out copies of their film to alternative groups met through its making, word of mouth and on their website. Instead of promoting his work at festivals, Mareček wants to make films that create “an open space” for dialogues. He envisions Czech documentaries as more than a wave of cinema, but sources of critical understanding for forums beyond screenings. Since the end of the Second World War, the central position of the Czech lands has been at odds with its confinement to the East. The recovery of its continental balance entails experiments to keep up contention with encroaching conventions. Even restored to Europe, the country faces its reputedly passive role as a barometer of social pressures and weathervane of trends. But the image does not hold true for nonfiction films, where, converting possibilities, the Czech Republic acts as an engine of documentary. Gabriel M. Paletz is on the senior faculty of the PCFE Film School in Prague, where he teaches documentary and screenwriting.